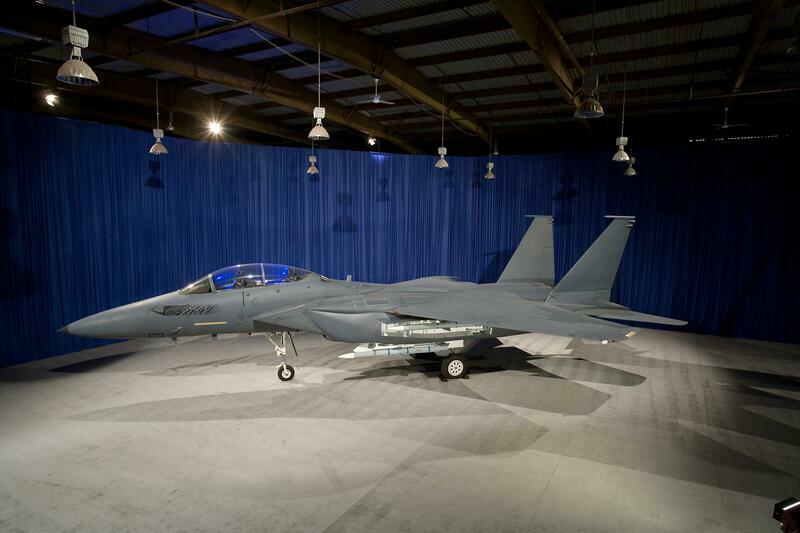 "Another Obsession, Another Stunning Project"
​On 17 March 2009, Boeing first displayed a F-15SE demonstrator. The F-15SE was designed to use fifth-generation fighter technology, such as radar-absorbing materials, to significantly reduce its radar cross-section (RCS). It would have possessed a level of stealth that the U.S. government would have allowed for export, being optimized for air-to-air missions (against X-band radars) and much less effective against ground radars (which use other frequencies). Different levels of RCS reduction were studied, and Boeing stated that this stealth will only be in the range of fifth-generation aircraft such as the F-35 Lightning II from the frontal aspect. Unique features to the F-15SE were the conformal weapons bays (CWB) that would have replaced the conformal fuel tanks (CFT) to hold weapons internally – thus reducing fuel capacity – and the twin vertical tails canted outward 15° to reduce RCS. Weapons can also be carried externally on hardpoints under each wing. 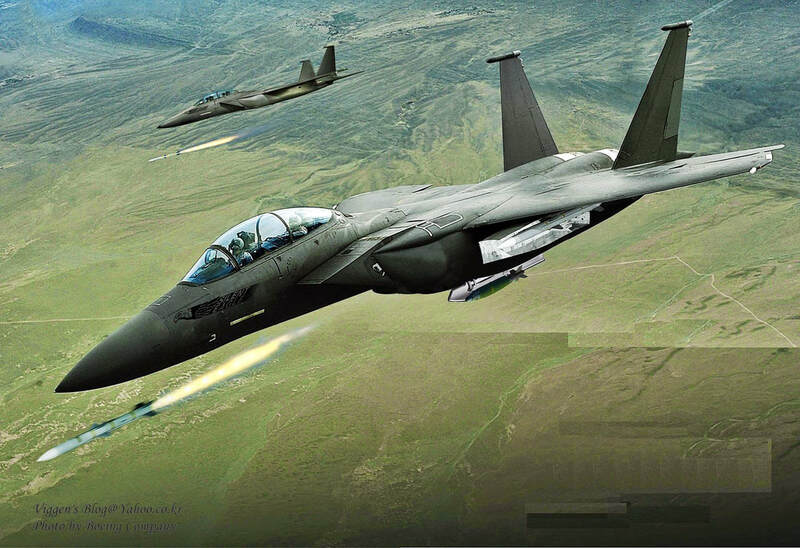 New build F-15SEs were to be lighter and more fuel efficient than Strike Eagle conversions due to the canted tails, fly-by-wire controls, and digital electronic warfare equipment; enabling two additional weapons stations on the wings. The aircraft was to have a Raytheon active electronically scanned array radar, and a new BAE Systems EW system. In March 2009, Boeing formally launched the F-15SE for international sales; it was aimed at F-15 users such as Israel, Saudi Arabia, Japan, and South Korea. Boeing estimated the unit cost as approximately US$100 million, including spares and support; its lower cost compared to fifth generation fighters was intended to appeal to the export market. In 2009, Boeing began tentative talks with South Korea over the Silent Eagle, but was unable to market it to international customers without an export license from the US government. Boeing filed for an export license in early 2010, and received it in July 2010. In August 2010, clearance was granted to export the F-15SE's RCS treatments and EW suite to South Korea. During August and September 2009, Boeing evaluated an F-15E with different radar absorbent coatings to select a coating. The first production F-15E (86-0183) was modified to the F-15E1 configuration to serve as a demonstrator. It first flew on 8 July 2010 with a left-side CWB, and on 20 July 2010 launched an AMRAAM from a CWB. 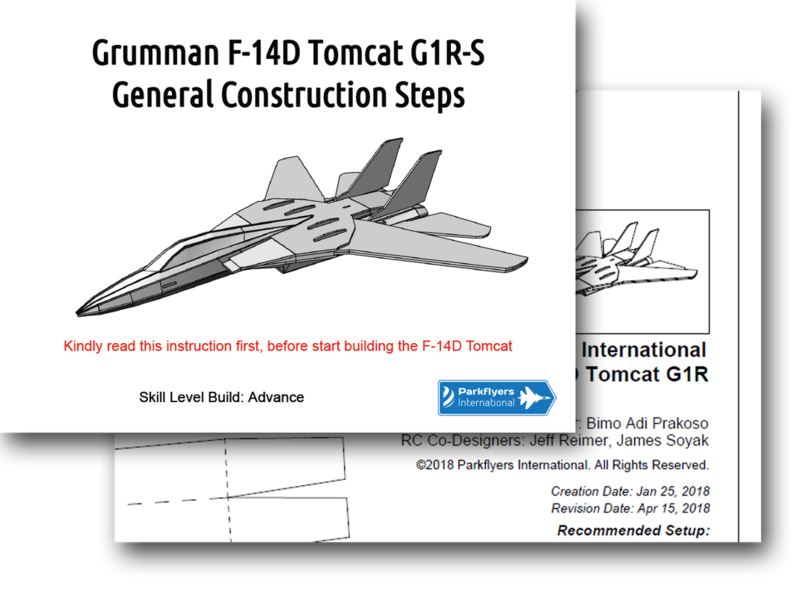 We had done and released the F-15C Strike Eagle G1R PDF plan few years ago. It received huge responses from many communities and positive acceptance. So, with that in mind, we would like to bring in the latest variant of the deadliest combat proven jet in the history. 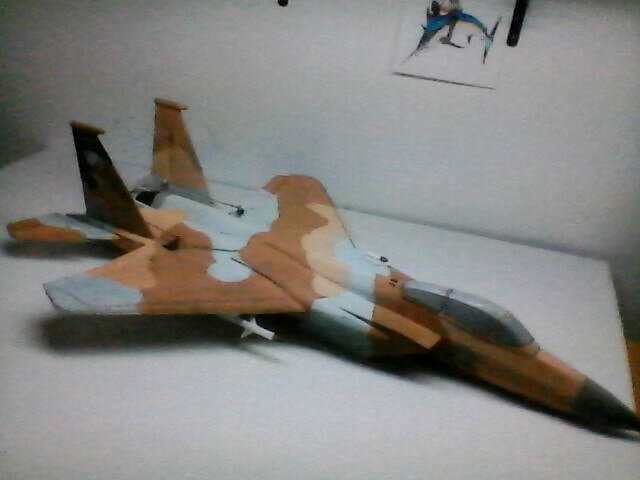 Then, we decided to put the F-15 Silent Eagle to our parkjets line up. Easy to medium complexities so many builders and flyers would be able to build and fly it soon enough. However, we tried to experiment with some additional common materials like thick papers to simplify the building process yet adding more scale look to it. The use of ommon parts and materials similar to other parkjets. 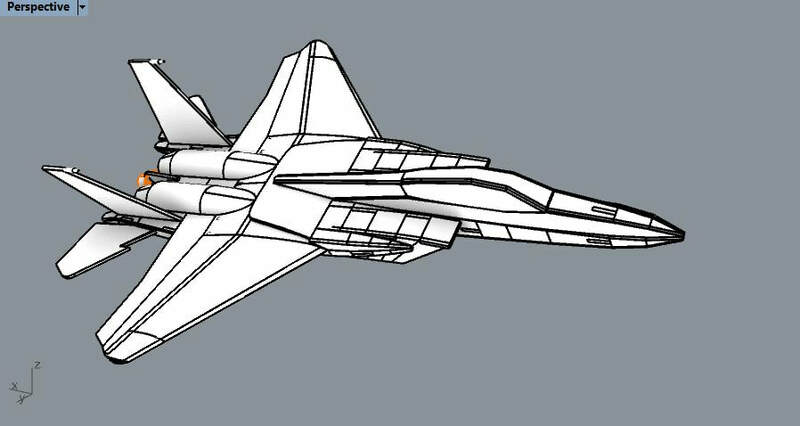 True airfoil wing design generate better lift, as it will also give better look to the F-15 Silent Eagle. 2 ailerons and 2 elevators with some room for rudders mod. However, we decided to remove the Conformal Weapon Bay (CFB) on both sides to reduce the building complexity. 1st prototype was built by PI member, Jeff Reimer, in Canada. Jim followed with the 2nd one. Both flew flawlessly awesome. Bimo got the last 3rd built before the plan is made public. The maiden flights were simply stunning. No wonder Boeing resurrected the F-15 Strike Eagle into F-15 Silent Eagle. These PI F-15 Silent Eagles were soaring nicely in the sky in glorious speed, agility and of course stability. When airborne, they definitely looked like store bought planes. However, this is the finest scale looking design of the Silent Eagle out there at this very moment. Even on the table, this Silent Eagle is an entity that is amazingly good to look at and observe. True scale lines yet very easy to build, adding up more excitements to our existing score-n-fold parkjet designs. The turtle deck as well as airfoil wings. Round thrusters option with rolled 3mm depron or thick papers. Incredibly stable on maiden event, just like flying on rails. Incredibly agile and fast when taking 100% throttle/on WOT. Below are the recommendation setup for this parkjet to get the most joy and fun, in flying it. Turnigy 2826 2200KV as standard motor that will not break the budget and is still being able to fly fast. If you want to fly faster, a DYS BE2208-7 2600KV or Sunnysky X2208-7 2600KV II motor will give the most punch out of the power setup and still give exceptional flight time. ESC: 40A Brushless ESC for casual flying. If you love WOTS, then go for 50A ESC. This ensures the ESC will stay cool. 1,800mah 3S 30C or 35C battery. The weight of this battery match the stock CG. It will give around 10 mins flight time as well on mix punches of throttle. "The Plane that flies beautifully in speed with a great level of stability and agility"
The real F-15 Silent Eagle is a concept jet that continues to extend the glorious period of the earlier F-15 Strike Eagle. 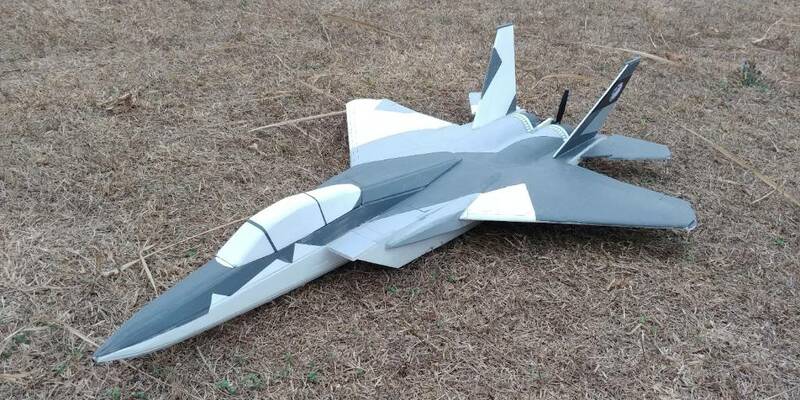 This PI F-15 Silent Eagle, renders the scale look and performance of the real one, making it a good plane to build and fly. The PDF plan is available for a small amount of donation (USD 11.99) which would be used to support underprivileged kids and help less fortunate families to learn how to build scratchbuilt rc planes and try to make a living from it by creating rc plane toys and repairing it. We encourage you not to share or distribute the plan, individually or publicly as it may not bring support to the teaching activities we conduct for those kids and families. 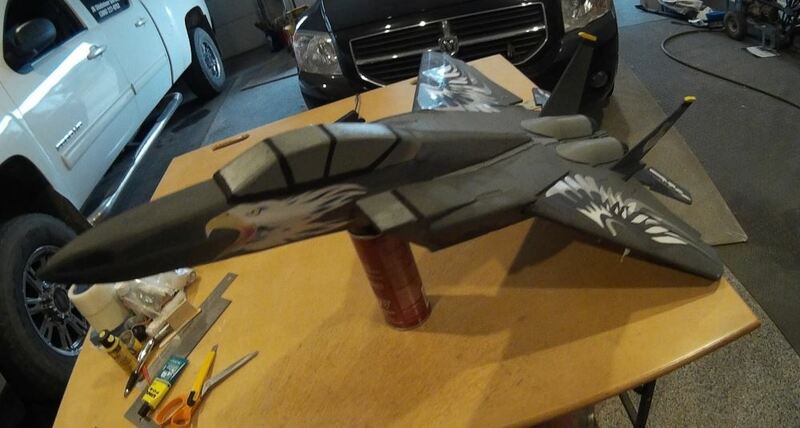 This F-15 Silent Eagle G2R Scratchbuilt is for experienced builders. PDF plan is available as fully untiled A0 paper size and tiled both Letter and A4 paper size. 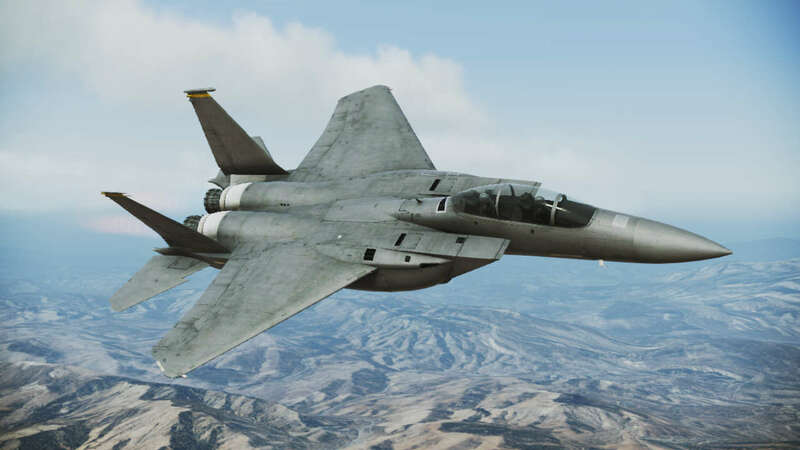 By clicking the DONATE button, you agree to donate USD 11.99 and receive the F-15 Silent Eagle G2R scratchbuilt plan. Please provide a valid email address during donation confirmation process in Paypal page, so we could send you the plan. We all thank you for your kind support for the learning activities we conduct.